Click image to enlarge Sign, Ecola State Park, Oregon. Image taken June 28, 2010. 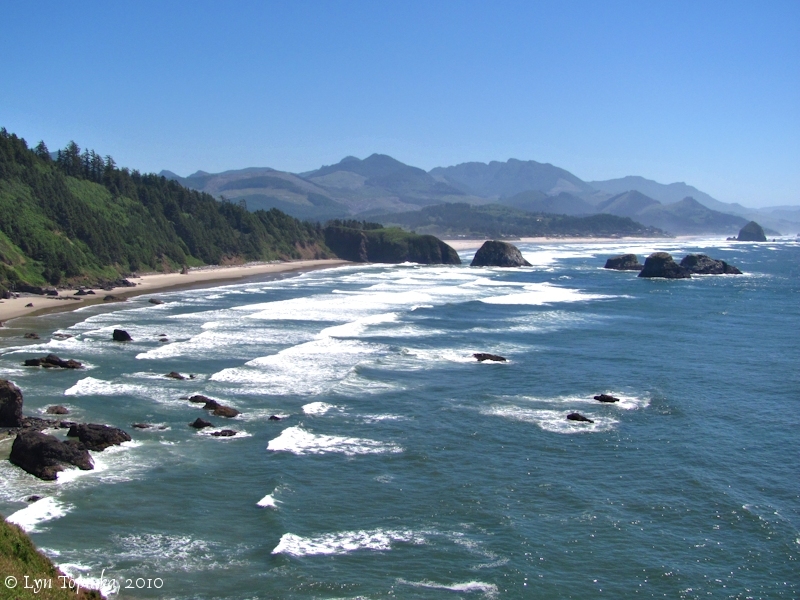 Oregon's Ecola State Park wraps around Tillamook Head and features nine miles of Pacific Ocean shoreline. To the north is the Oregon community of Seaside and Clatsop Beach. To the south is Ecola Creek and Cannon Beach. The nearly 1,024-acre park is popular with hikers, whalewatchers, surfers and beachgoers. "Lands were acquired between 1932 and 1978 by gift and purchase from private owners and the federal government. The original tract of 451 acres was acquired in 1932 by gift and purchase from the Ecola Point and Indian Beach Corporation with corporation members Rodney Glisan, Florence Minott, Caroline and Louise Flanders donating their portion. This land includes much of the ocean frontage in the park, extending from the northern edge of the city of Cannon Beach to Indian Beach. 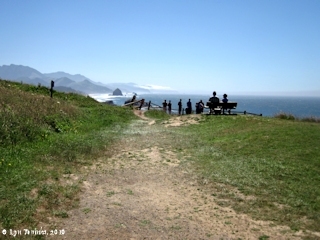 Later, lands were acquired to the north of Tillamook Head extending toward Seaside, providing a route for the Tillamook Head trail. Samuel Boardman, Henry Van Duzer and others worked hard to acquire this park land for Oregon in the 1930s and 1940s. Sam Boardman stressed the importance of acquiring a wider strip of land to protect the shoreline forest from wind damage and other threats. Some lands were purchased from Crown Zellerbach Corporation after being logged, and the World War II Army radar station tract on Tillamook Head was acquired under Chester. Armstrong's direction in 1952. The donation of the Elmer Feldenheimer Forest Reserve adjoining the northeast portion of the park aids in park protection from the elements. 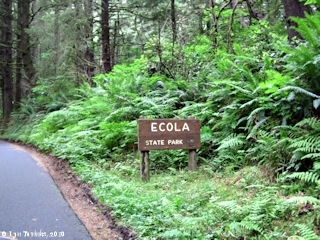 Ecola Park contains examples of old growth Sitka spruce, western hemlock and habitat for elk and deer. 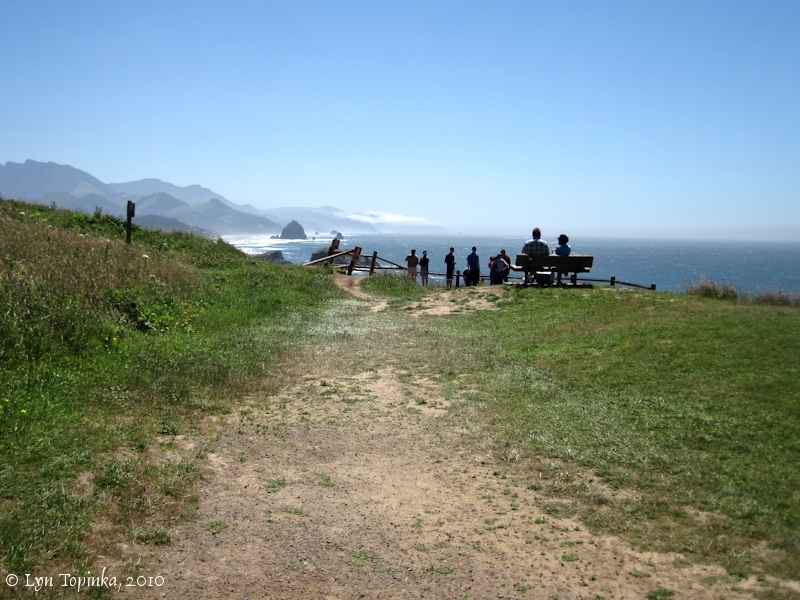 Here, in 1806, Captain William Clark of the Lewis and Clark Expedition viewed burial canoes of the Kilamox (Tillamook) and, looking south from Tillamook Head, he described the view as the "grandest and most pleasing prospect" he had ever surveyed. Ecola Park was developed originally by the CCC under National Park Service direction between 1934 and 1941. Improvements included roads, picnic facilities, trails, the office, workshop and caretaker's house. 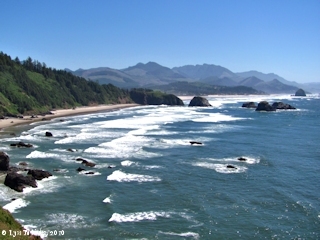 In the early 1950s, a campground was developed at Ecola in the wave of enthusiasm which came with post-war development of the Oregon state parks. The camp was abandoned in 1954 as inappropriate to the setting. Some of the shallow soils on steep slopes at Ecola Park are subject to rapid erosion following heavy rains. In 1961, a landslide at Ecola Point damaged 125 acres and caused the park to be closed for 10 months. Other slides have been a problem at Bald Point and between Ecola and Chapman Points. The latter affects the park entrance road. A slide here closed the park for four months in 1975. Within Ecola Park is a National Recreation Trail dedicated in April, 1972. This is the Tillamook Head Trail extending six miles from Seaside to Cannon Beach. Tillamook Head is a high point on the trail between Seaside and Indian Beach. It is named for the Tillamook tribes in whose ancestral territory the headland is located. The trail follows the coastal exploration route used by Captain Clark in the winter of 1806." Click image to enlarge View of the Oregon coastline looking south at Crescent Beach and Chapman Point, as seen from Ecola Point, Ecola State Park, Oregon. Note Haystack Rock on far right. Image taken July 14, 2010. Click image to enlarge Path to Chapman Point, Ecola State Park, Oregon. Haystack Rock is visible. Image taken July 14, 2010. Click image to enlarge Marker, Chapman Point, Ecola State Park, Oregon. Image taken July 14, 2010. Click image to enlarge View south from Chapman Point, Ecola State Park, Oregon, with Haystack Rock in the distance. Image taken July 14, 2010. 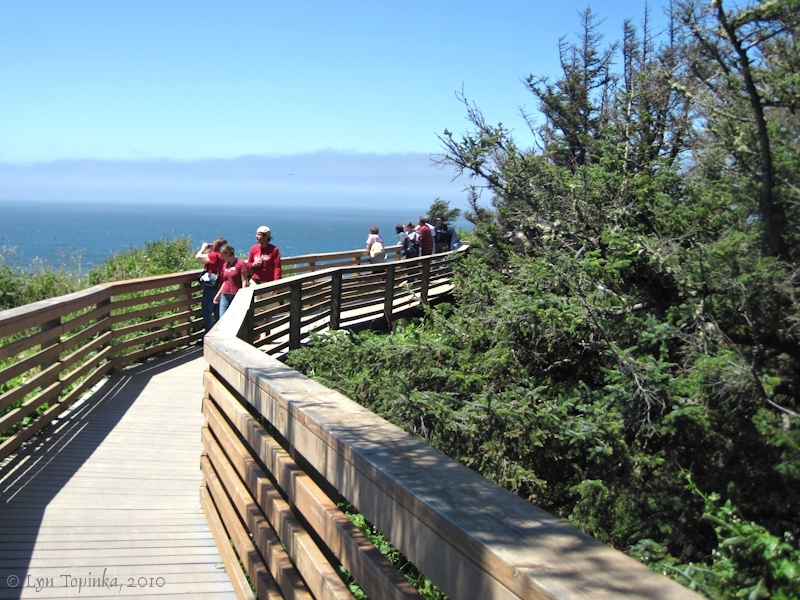 Click image to enlarge Path to Ecola Point, Ecola State Park, Oregon. 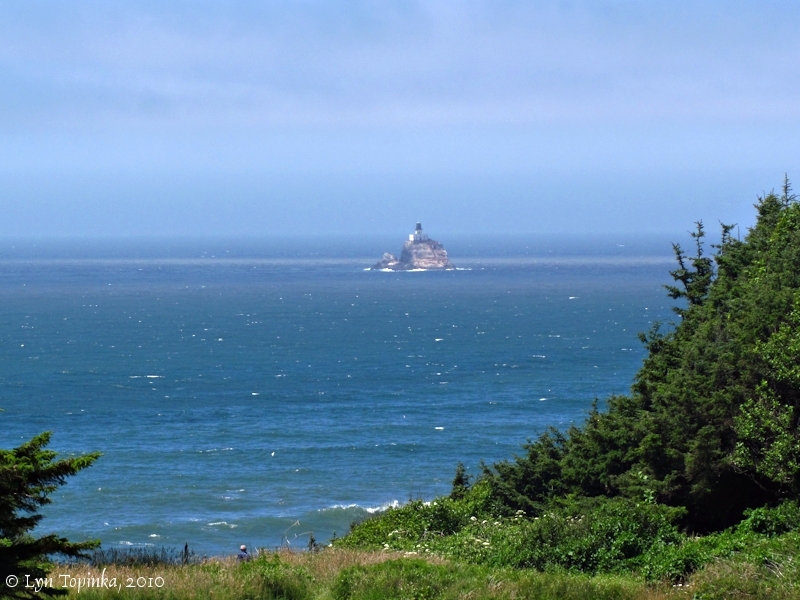 Tillamook Rock Lighthouse is just visible in the distance. Image taken July 14, 2010. Click image to enlarge Boardwalk to the Seal Rocks, Ecola Point, Ecola State Park, Oregon. Image taken July 14, 2010. Click image to enlarge Seal Rocks, Ecola Point, Ecola State Park, Oregon. Image taken July 14, 2010. 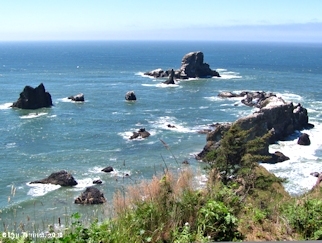 Click image to enlarge View of the Oregon coastline looking north at Bird Point, Indian Point, Indian Beach, and Bald Point, as seen from Ecola Point, Ecola State Park, Oregon. Image taken July 14, 2010. Ecola State Park is located off U. S. Highway 101, along the Pacific Ocean, adjoining the northern boundary of the city of Cannon Beach in Clatsop County. The park extends along the ocean shore line a distance of approximately six miles. 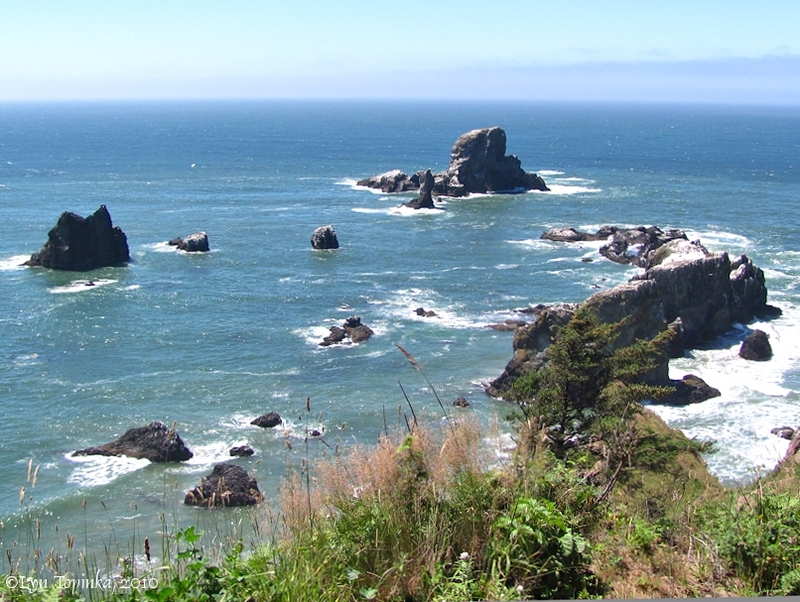 It includes the most westerly promontory in Clatsop County, known as Tillamook Head, and two other view points—Ecola and Indian Points. 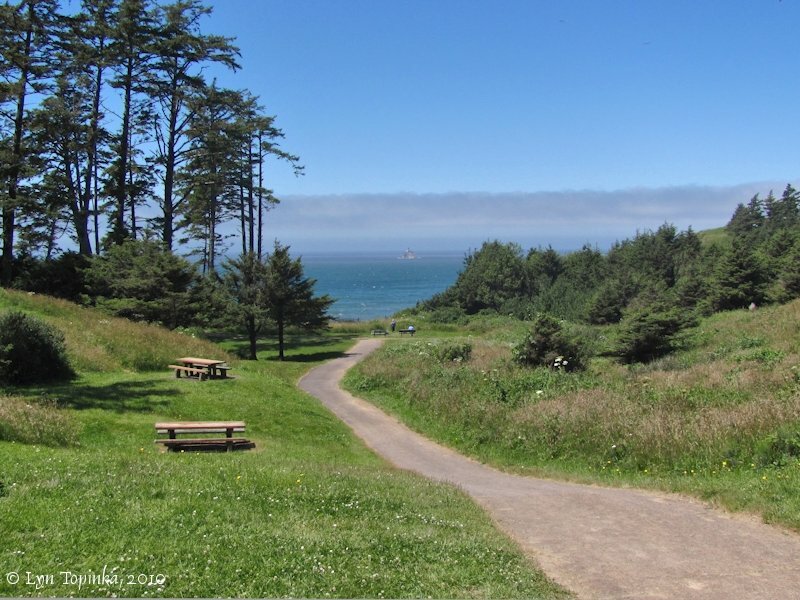 The first land acquired for this park was 451.18 acres in 1932 from Ecola Point and Indian Beach Corporation. Rodney Glisan, Florence Minott, Caroline W. and Louise Flanders donated their one-half interest in the property. The other one-half interest was purchased from Allen Lewis at a price of $17,500. Land for a trail over Tillamook Head was acquired, without cost, in December, 1947, by three easements as follows: 7.05 acres from Ida Fleming, 15 acres from Angora Club of Astoria and 1.95 acres from A. W. Kendall. A tract, containing 109.39 acres was acquired from the U. S. Government Land Office on July 20, 1942, at a cost of $1.25 per acre. 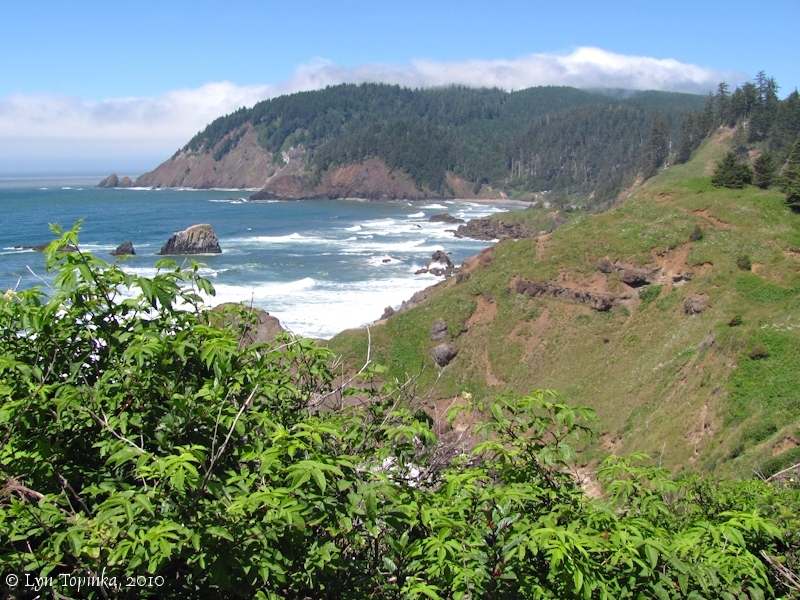 Another tract of 80.62 acres, including the summit of Tillamook Head, was purchased from the government for $2,195, only 50% of the appraised value. Clatsop County presented 112.80 acres to the state in 1948, and three parcels of land totaling 329 acres were purchased from Crown Zellerbach Corporation in 1940, 1948 and 1954, respectively, making an aggregate of 1,106.99 acres in the park as of the close of 1963. The land is covered with a heavy growth of timber and brush indigenous to the Oregon country. Tillamook Head contains a heavy stand of old growth fir trees. The terrain is generally rolling to steep. Land fronting on the ocean is steep and shows signs of slides. The portion on which the use area was located moved oceanward in early 1961, causing loss of facilities roads and parking area. 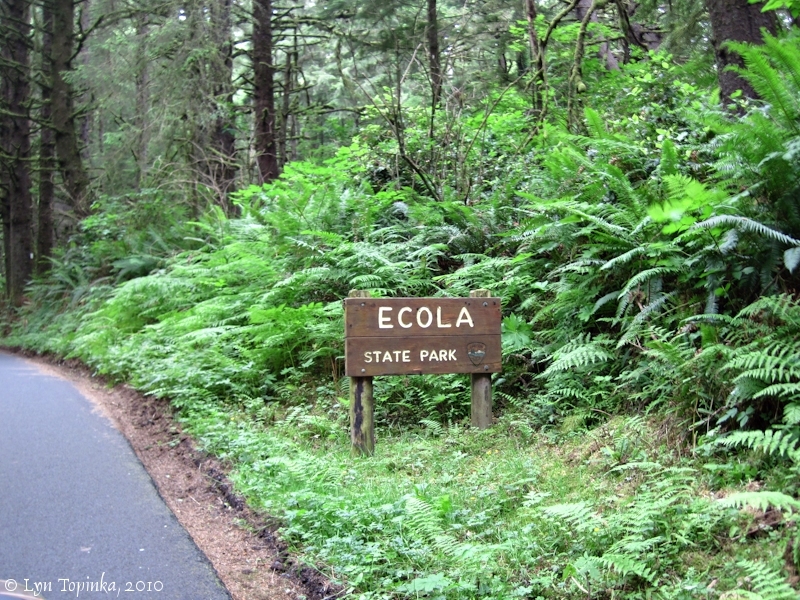 The name Ecola is a part of the name of the corporation owning the land comprising the first acquisition for the park—Ecola Point and Indian Beach Corporation. However, Lewis A. McArthur in Oregon Geographic Names says, Captain William Clark on January 8, 1806, called the stream, now known as Elk Creek at Cannon Beach, Ecola or Whale Creek, but both names fell into disuse. Sometime prior to 1900 a promontory at the south edge of the park was named Ecola Point. He also states that a post office located at the mouth of Elk Creek was named Ecola in 1910, but the name was changed to Cannon Beach in 1922 because of confusion with Eola. The name Ecola came from the Chinook Indian word ekoli meaning whale. 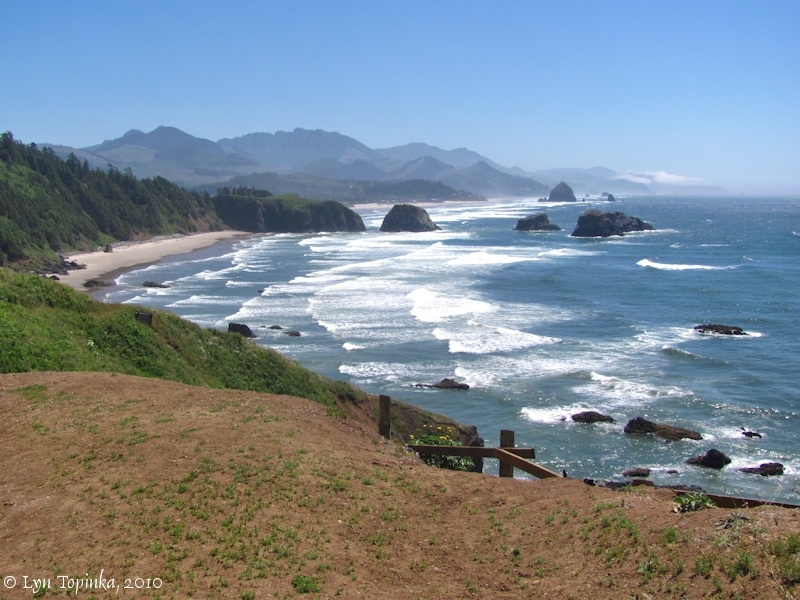 These reasons suggested the name Ecola, therefore the name Ecola was adopted for the park. For many years a herd of Roosevelt elk as well as many deer have roamed through the park and the surrounding country with little fear. 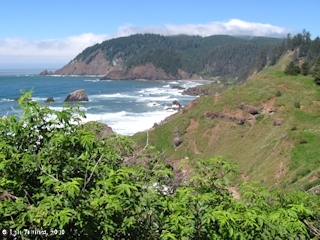 Tillamook Head is one of the outstanding promontories of the Oregon coast line. Ocean views from several points in the park are superb. Sea Lion Rock, one of the many jagged rocks to dot the shoreline, is located one-half mile offshore and is a natural resting place for sea lions and shore birds. It is sometimes referred to as Arch Rock because of its shape. The setting sun lends an atmosphere of enchantment for the evening visitor. The first real work in improving the park for public use was by the Civilian Conservation Corps. Starting in October, 1934, a camp for 200 men was established. The men located property lines and constructed roads, trails, car parking area, fire guards, camp buildings, caretaker's cottage and viewpoints. This was followed by a project under SERA doing similar work. Later, the roads were widened, car parking areas extended, picnic area enlarged and the water system improved to supply additional water. The timber on the 1961 slide area was sold and the land drained. Because of the slide, the park was closed. It was opened for partial use in 1963. 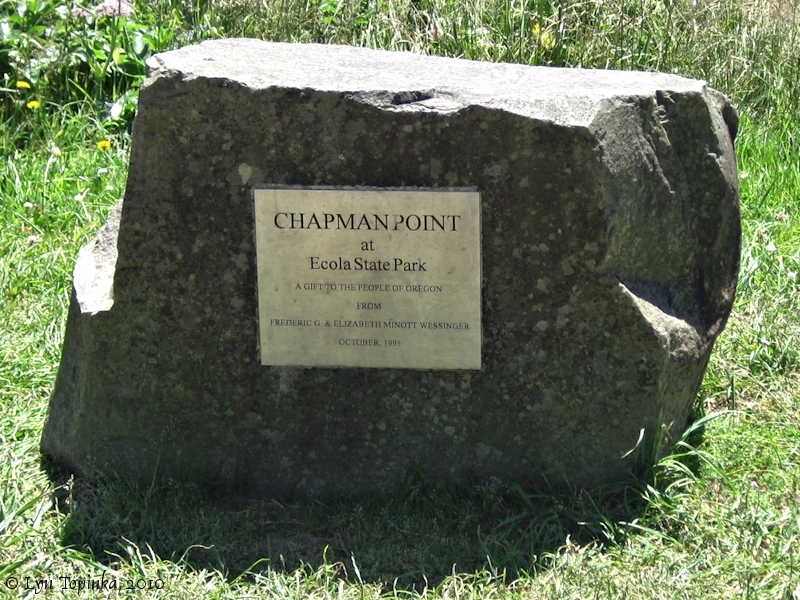 A plaque was installed in Ecola Park to honor the donors of the land first acquired. However, the slide of 1961 damaged the base but the plaque itself was saved and is now in storage waiting to be relocated in the park. A rustic type sign giving information about Ecola and Oregon history was placed along Highway 101 about 300 feet south of the Cannon Beach junction. Still another rustic sign and a likeness of the cannon to which it has reference are located along Highway 101 at mile post 34.4. Tillamook Lighthouse, located on an offshore rock, can be seen from the several viewpoints. The Corps of Engineers built a temporary road to Tillamook Head in 1944 and leased 25 acres on Tillamook Head for radar purposes during the war. The boys from MacLaren School at Woodburn did cleanup jobs in the park, built trails to the beach at Indian Creek and improved existing trails. They started work in 1953 and continued till 1956. A new road from the park use area to Indian Creek was constructed in 1954 after abandoning the old road. This project made a direct route from the park use area to Indian Creek and Tillamook Head. A small overnight camp was placed in the park in 1953 but was abandoned in 1954 because of the objection by the donors, the Flander sisters, who thought it was not in accordance with their gift. Day use at Ecola in 1963 was 177,052 visitors."